Eric Knowle's wickedly funny "Antiques Antics" is appearing at theatres across the UK and described as “an absolutely terrific show”. Includes pre-show valuations. 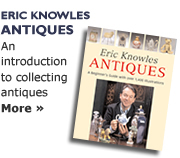 Join Eric Knowles on a delightful tour led by one of Britain’s best-loved antiques experts. Meet Eric Knowles and his team of restorers. Have your antiques and collectables valued by the experts and pick up some restoration advice too.